Deal Alert: Nokia 8 Is Selling For Rs 26,899 On Amazon, Further Discounts Available On Exchange - AndroGuider | One Stop For The Techy You! HMD Global announced the Nokia 8 Sirocco yesterday. The 8 Sirocco replaces the Nokia 8 as the HMD's flagship smartphone for the Indian market. 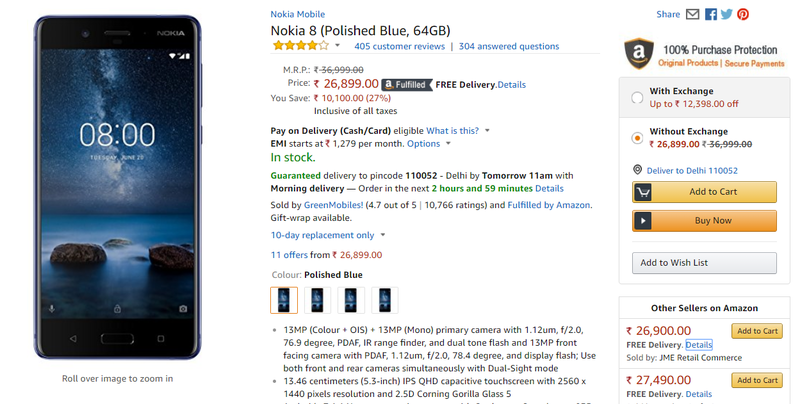 In the light of the launch of the 8 Sirocco, HMD has slashed the price of the Nokia 8 by Rs 2,100, and the handset is currently retailing at Rs 26,899. Further discounts are available via exchange. The maximum discount of Rs 12,398 can be achieved by exchanging a Pixel 2. The Nokia 8 was launched in October 2017 with a price tag of Rs 36,999. After the launch of the 8 Sirocco at MWC, the Nokia 8 received a price cut of Rs 8000 which brought down the price of the device to Rs 28,999. As a reminder, the Nokia 8 sports a 5.3" QHD IPS display which is backed by Corning Gorilla Glass 5. The phone is powered by the Snapdragon 835 coupled with 4GB RAM and 3090mAh battery. There is a dual camera setup at the back comprising of two 13MP & f/2.0 sensors. The primary sensor is an RGB one and has Optical Image Stabilization, while the secondary sensor is monochrome. At the front there is a 13MP snapper which has an aperture of f/2.0. The Nokia 8 has 64GB of internal storage which can be expanded using a microSD card. The headphone jack is present and the phone is rated as IP54 dust and splash resistant. The Nokia 8 was recently updated to Oreo 8.1.